To say that The Dunwells’ sophomore studio album ‘Light Up the Sky’ has been “a long time coming” might be a bit of an understatement. That particular lyric turns up repeatedly in the songs on the album, and the songs themselves have indeed taken their time coming together. Many of these tracks are pulled from the Dunwells’ recent back catalogue, having been released as singles or EP tracks in the interim since the band’s 2012 debut ‘Blind Sighted Faith’. The Dunwells worked with a string of different producers on ‘Light Up the Sky’, including Kodaline helmsman Steve Harris, Dan McDougall (Aurora) and Manny Marroquin (Haim, Sia and Taylor Swift). Of those, it’s Harris’ influence that rings through most glaringly in the slick pop overlay of many of the songs. ‘Communicate’, which appeared on The Dunwells’ ‘Show Me Emotion’ EP back in 2014, overcomes a thickly layered vocal production to showcase the wide expressive range of frontman Joe Dunwell’s singing voice and Rob Clayton’s solid bass groove. The extended anticipation of ‘Strange Feeling’ starts with an acoustic intro before sweeping into the breathless lyrics “it’s a strange feeling, but it’s sensational.” Gentle keyboard-centered ballad ‘Animal’ feels like it could as easily have been written for Kodaline as the Dunwells, while later track ‘Ghosts’ features a beautifully executed, though conspicuously Steve Garrigan-esque, vocal manoeuvre in the final repeat of the chorus. Standout track ‘Hurts’, released as a single just last month, is probably the most lyrically developed and fully conceptualised song on the album, from its opening line “here you are on your knees, trying to offload your grief” to the sympathetic lines of its chorus “when you fade right there in front of me, it hurts sometimes . . . when you fall apart it’s killing me, it hurts sometimes”. The lyrics to subsequent title track ‘Light Up the Sky’ are romantic and deliriously nonsensical, but they make an equally forceful impact, due in no small part to Dunwell’s aching vocal delivery. The Dunwells have, in the past, gotten away with some cliché lyrics, because they were always delivered with guileless musical arrangements and undeniable emotional sincerity. On ‘Light Up the Sky’, the production sometimes feels heavy-handed, as if trying to conceal the occasional moments where the lyrics are a bit trite or the emotional content is one-dimensional. Such is the case with older live favourite track ‘She Whispers’, whose arrangement here contains some odd instrumental choices that don’t seem to relate to the song itself. For my money, the stripped back version featured in this Live Gig Video was more effective in creating the sense of intimacy implied in the lyrics. The touch of Steve Harris’ production is felt again in penultimate track ‘The Best is Yet To Come’, which soars seamlessly if rather unexpectedly into the sweet, subdued gospel of ‘Will You Wait for Me’. Though the latter is a song about loss and mourning, the Dunwells have here refined their propensity for building a chorus, turning it into a gently soulful, genuinely uplifting reaffirmation of life. In the end, I found ‘Light Up the Sky’ to be mildly underwhelming, not because it’s a bad album, but because it leaves the impression of having transformed the Dunwells, who are a fine alt-rock band in their own right, into a pale imitation of a mainstream pop band. And though I like Kodaline enough, I much prefer the Dunwells, especially when they sound like, well, the Dunwells. 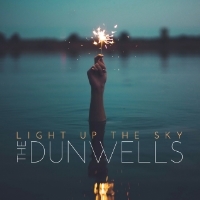 The Dunwells’ second album ‘Light Up the Sky’ is out today, the 26th of February, on Decca Records (UK) / Modal Music Limited (US) / Concord. The Dunwells are scheduled to appear next month at SXSW 2016 and will embark on a tour of the UK in April. Leeds alt-rockers the Dunwells will play a run of live dates in the UK this spring, following the release of their new album ‘Light Up the Sky’ and their trip to America for SXSW 2016. The album is out today on Decca/Concord (Carrie’s review posts today at noon), but we at TGTF have already featured several tracks from it in our collected coverage of the Dunwells. Support for the ‘Light Up the Sky’ tour will be played by American indie rock band Bronze Radio Return. Tickets for the following shows are available now. For any Crowded House fan, or really for anyone who lived through the late ’80s, the title of the Dunwells’ new track ‘Hey Now’ is sure to conjure up echoes of the Neil Finn-led band’s breakout hit ‘Don’t Dream It’s Over’. But once you’re past the opening line, the Dunwells’ track strikes a very different tone from the Antipodean band’s 1986 release. The main similarity between the two songs is in their lyrics, which are in both cases non-specific but heavily laced with possible hidden meaning, allowing the emotional tone of the musical arrangement to lead the listener’s imagination. Building on their previous ‘Lucky Ones’ EP, the Dunwells have clearly continued to focus on the details of their instrumental arrangements with ‘Hey Now’, leaning less on traditional guitar riffs and more on their collective vocal abilities. The first sonic impression of ‘Hey Now’ is percussive, its forceful drum beat underscoring frontman Joe Dunwell’s emotive lead vocal as he intones the title lyric ‘hey now, it’s been a long time coming / but I’ve been ready for a while”. The guitar melody is surprisingly understated, as thick layers of gospel-style backing vocals highlight the song’s anthemic lyrics, particularly the repeated plea “leave a light, leave a light on”. The dizzying swirl of backing vocals and the persistent keyboard ostinato take center stage in the final repeat of the chorus, as the arrangement builds in intensity, then draws back in anticipation of its closing strains. ‘Hey Now’ is the first teaser from the Dunwells’ upcoming new LP, which is currently slated for release sometime in 2016. If you’re keen in hearing more from the Dunwells in the meantime, you can check out our archive of past coverage on the band, which includes the title video from the band’s previous EP ‘Lucky Ones’ and a stream of the title track from their standout 2014 EP ‘Show Me Emotion’. The group recently announced a headline tour of the UK for this November. You can find a listing of those live dates here.